British Columbia is a diverse destination with stunning scenery, an array of outdoor activities and exciting cities such as Vancouver and Victoria, BC’s capital. Whether you are planning a quick couples' getaway or a honeymoon vacation, there are destinations and accommodations that fit every interest. You can create an exciting itinerary whether you are visiting for a weekend trip or planning a longer vacation in Canada. The rustic Emerald Lake Lodge in British Columbia was built in 1902 by the Canadian Pacific Railway. 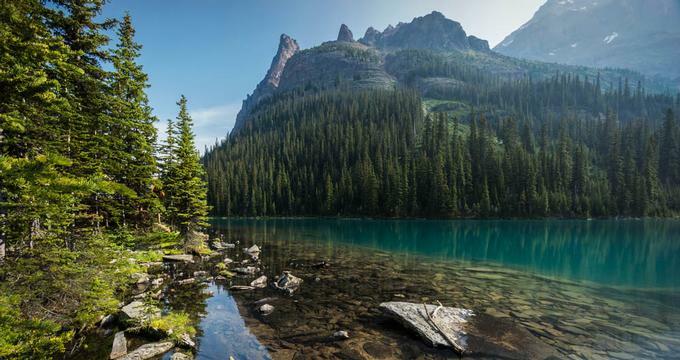 Yoho National Park, just 25 miles west of Lake Louise, is known for its hiking and cross-country ski trails. The Lodge has a complimentary shuttle bus to the Lake Louise Ski Area in the winter. Excellent heli-skiing is available at Purcell Heli-Skiing. Fossil hunters come from around the world to visit the Burgess Shale on Mt. Burgess. If you get tired after all the outdoor adventures, you can always sit in the lodge's hot tub and watch the Northern Lights. Each of the 85 guest rooms are housed in alpine cabins which surround the main lodge building. All rooms are equipped with wood burning fireplaces, private bath, telephones and a coffee maker. Mt. Burgess Dining Room offers hearty Rocky Mountain Cuisine. The impressive log structure of Cilantro on the Lake is a popular dining spot in summer and a meeting facility in the winter. The Kicking Horse Lounge is great for drinks any evening and tea is served on the verandah in the summer. 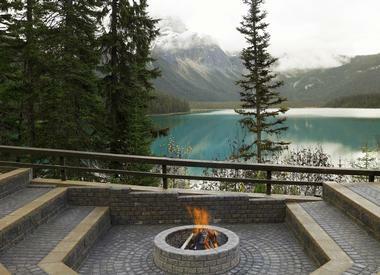 The lodge is 10 kilometers off of the Trans Canada Highway and a 2.5 hour drive from Calgary. Room rates range from $150 to $850 CAD per night (800-663-6336, 403-410-7417). 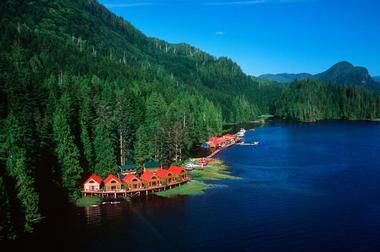 The Wickaninnish Inn is located on the west coast of Vancouver Island in Canada overlooking the Pacific Ocean. The inn is a beautiful, romantic vacation hideaway surrounded by the ocean and a forest. If you are looking for secluded vacation spots, this is the destination for you. Chesterman Beach, one of the nicest beaches in Canada, is located just steps from the inn. Guests can choose from a variety of activities, such as whale watching, sea-kayaking and nature tours. The Ancient Cedars Spa offers a number of spa treatments using natural ingredients and custom blended aromatherapies. Guests can choose from hydrotherapy, hot stone massage, reflexology, acupressure, body scrubs, wraps and customized body masques. The Ancient Cedars Spa is an Aveda-concept spa based on principles of Ayervedic medicine. There are 46 guest rooms featuring elegant rustic design and local artwork. The rooms have magnificent ocean views through the floor-to-ceiling windows, private balconies and oversized bath tubs. The Pointe Restaurant provides a 240 degree view of the Pacific Ocean. The menu incorporates local produce such as giant roasting oysters, Tofino smoked salmon, mushrooms and locally produced goat cheese. The hotel and Chesterman Beach border Pacific Rim National Park, a 30-mile area of rugged coastline on the west coast of Vancouver Island and a great vacation spot for outdoor enthusiasts. Summers are warm and offer the widest selection of outdoor activities. Whale watching season is March through May. The hotel can be reached either by air from Vancouver and Seattle, or by automobile. Travel time is approximately 50 minutes from Vancouver International Airport. The inn provides shuttle service to and from the Tofino Long Beach Airport. Room rates from about US $260 in the winter and from US $480 in the summer. There are several packages you can choose from, including romance, spa, gourmet and nature lovers packages (800-333-4604, 250-725-3100). Assiniboine Lodge is Canada's oldest backcountry ski lodge. 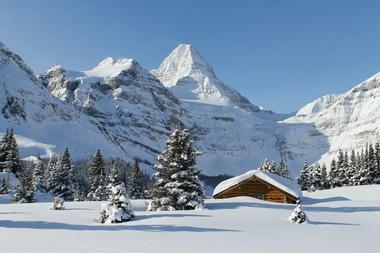 Located the Mount Assiniboine Provincial Park in the beautiful British Columbia's mountains, the lodge is the ultimate adventure getaway for skiers in the winter and hikers in the summer. The property is now open, following an extensive renovation led by BC Parks. Originally built in 1928 by the Canadian Pacific Railway as the first ski lodge in the Canadian Rockies, the lodge's foundation started to fail. During the renovation, the historic building had to be rolled 50 feet forward onto the meadow to rebuild the foundation. The original ambiance was carefully preserved during the restoration. The full service hotel can accommodate 30 guests at a time in 7 private cabins and 5 lodge rooms. Activities and services include guided hiking and ski touring, gourmet meals, warm showers, rolling in the snow after a sauna and goose down duvets. 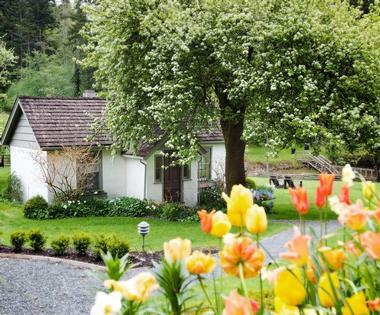 Hastings House Country House Hotel is a luxury waterfront getaway set on 22 acres on Salt Spring Island, British Columbia. This seaside resort offers scenic island views, 18 unique rooms and suites, a restaurant and a spa. The hotel restaurant serves regional cuisine complemented by artfully selected wines from the area and from around the world. On your romantic getaway, indulge in relaxing treatments at The Spa which offers a varied menu of services. Other vacation activities include shopping and romantic walks in the nearby village, hiking, sailing, whale watching, kayaking and fishing. Plan a wedding at this hideaway in British Columbia. You can get married on the water's edge in the summer, and take stunning wedding photos in the hotel's flower gardens. The head gardener Shelley Kobylka is available for private garden tours, just be sure to ask ahead of time at Reception. Hastings House has its own kitchen gardens for fresh flowers, vegetables, greens and herbs. Bountiful orchards grow sweet fruits and berries. Bonny O'Connor and Jerry Parks, owners of the hotel, support the local art community by showcasing sculptures in the gardens and throughout the hotel. Room rates start at $395/night (250-537-2362). Couples who stay at the Rockwater Secret Cove Resort in Sunshine Coast, British Columbia will be struck by the idyllic and romantic ambience. Many of the rooms have gorgeous views and spacious quarters, giving you the ultimate comfort during your stay. Most of the rooms offer complimentary Wi-Fi, televisions with cable, a coffee and tea maker, terry bathrobes, and a telephone. Guests can enjoy many of the outdoor activities offered at the resort, including hiking, biking, and yoga classes. On the property, there is also a dock at the beach, a kayak center, an outdoor swimming pool, and a beautiful Zen garden. 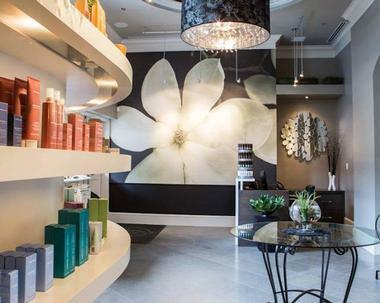 The on-site spa offers guests tempting treatments such as massages, facials, and esthetics. You don’t have to travel too far to find fine dining – the resort has an excellent restaurant where guests can savor their meals while enjoying the view the large windows provide. There are breakfast, lunch, and dinner menus, all of which offer a pleasant variety. The lunch and dinner entrees include everything from burgers and seafood to duck and venison (877-296-4593). British Columbia is famous for its pristine wilderness, beautiful views and lush forests. Painted Boat Resort offers 31 romantic villas on five scenic acres. 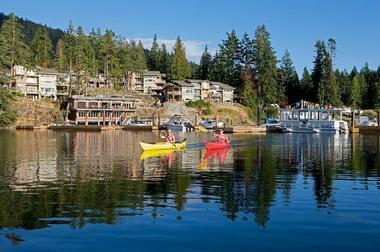 The resort is located two hours from Vancouver in Pender Harbour. During the day, spend your time outdoors hiking and enjoying a selection of water-based adventures. At night, watch the starry night sky. The resort offers a spa which can help you get over the jet lag and jump-start your vacation relaxation. 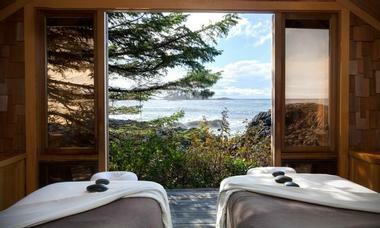 The spa offers ocean-inspired therapies featuring rich seaweed and salts. Choose from detoxing and rejuvenating treatments, relaxing massages and healing wraps. The infinity pool is open during the warmer season. The resort has a fitness center, hot tub, kayak rentals, and a deep-water marina. Two bedroom villa rates at the resort start at $250, depending on when you go. 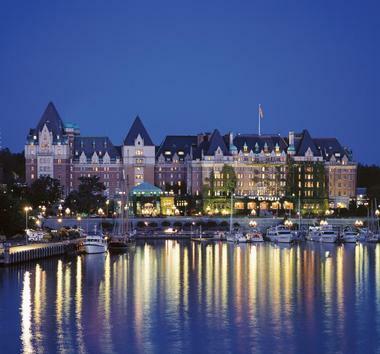 The Fairmont Empress is a beautiful romantic hotel located in Victoria, British Columbia, Canada. Check into this historic hotel to explore Victoria, get pampered at the spa, and engage in exciting activities such as ocean bound whale watching. The hotel opened in 1908 and has a long history. It has attracted many celebrity guests, including Rita Hayworth, Katherine Hepburn, Roger Moore, John Travolta, Barbara Streisland and Harrison Ford. The Willow Stream spa offers exclusive and specialized treatments using natural resources and indigenous ingredients such as purifying algae, rare muds, essential oils and herbs. Other activities guests can enjoy nearby include golf, kayaking, tennis, shopping, fishing, mountain biking, eco-tours, sailing and hiking. If you are planning a wedding, a reunion or organizing a company business meeting, the hotel offers six meeting rooms and a ballroom. The Victoria Conference Centre with 40,000 square feet of meeting space is attached to the hotel. Choose from 476 guest rooms with antique furnishings, including suites and Entrée Gold rooms and suites. Guest rooms have great views of the city, courtyard, or Victoria's Inner Harbour. Elegant dining is offered in the The Empress Dining Room which has been awarded a AAA 4 Diamond rating. Other dining options include The Bengal Lounge, a Victorian club lounge, and Kipling's, a casual family restaurant. Tea at The Empress is a daily afternoon tee service that has been offered at the hotel for over 90 years. Victoria is a charming city with art galleries, gardens and antique shops. Guests can visit Butchart Gardens, Royal British Columbia Museum and local wineries. If you are looking for something romantic, try the horse-drawn carriage ride. Victoria's International Airport is a 30 minute drive from the hotel. Taxis are available at the airport. A great way to arrive to Victoria is by sea. Take the ferry or the high-speed catamaran and enjoy a scenic ride. Check the hotel web site for seasonal offers and packages. Room rates from $199 CAD. If you are looking for a relaxing weekend getaway in Victoria, check into The Magnolia Hotel & Spa. The hotel offers stylish guest rooms and a luxurious spa with seven treatment rooms. You will feel pampered from head to toe at the Spa Magnolia which specializes in organic health and beauty treatments. Guest rooms are decorated in contemporary style with traditional touches, including floor-to-ceiling windows and deep soaker tubs in the bathrooms. Ask for a Diamond Room with a view of the Victoria Harbour which is especially romantic. This room has a 10-foot ceiling and a fireplace, perfect for a romantic spa weekend getaway. Have dinner at Catalano Restaurant which serves Mediterranean cuisine prepared with locally sourced ingredients. Cicchetti Bar is a great place to relax with a cocktail or a glass of wine. There are many fun activities and attractions to explore on your weekend getaway in Victoria, including shopping on Yates Street, Victoria's Chinatown and the historic Olde Town. Rooms at the hotel start at start at CAD $169 per night. The Pan Pacific Whistler Mountainside is an all suite hotel located in the heart of Whistler Village, at the base of Whistler and Blackcomb Mountains. The lodge is situated near the Whistler Village Gondola and Blackcomb Excalibur Gondola base stations giving its guests access to 7,000 skiable acres. In the summer, the area offers four excellent golf courses, fishing, horseback riding, and water sports. The hotel is a great getaway for families. The resort features a pool deck with spectacular views of the mountains. The pool deck, open year-round, has a heated outdoor pool, two outdoor hot tubs and a Steam room. Whistler is one of the top ski resorts in North America with ski lifts operating November through June. For those who want to ski in the summer, Blackcomb's Horstman Glacier operates from June to August. The Whistler and Blackcomb Mountains, the largest ski area in North America, offer over 200 marked runs, 12 bowls and three glaciers. The Whistler Valley offers 17.5 miles of track-set cross-country trails, ranging in difficulty from beginner to expert. Whistler Village is a charming mountain village with numerous shops, boutiques, fine restaurants and cafes. In the summer, guests can enjoy four great golf courses, including Nickalus North Golf Course, Chateau Whistler Golf Club, Big Sky Golf and Country Club, and Whistler Golf Club. Other summer vacation activities include white water rafting, hiking, mountain biking, fishing, rock climbing, and more. The resort offers 121 stylish suites with amazing views of the surrounding mountains and the village. Dubh Linn Gate Pub, popular with locals and visitors alike, has a traditional Irish pub atmosphere with pub food, a selection of imported beers, live music, and an outdoor patio. Browse more vacations for families. The hotel is located approximately 90 miles (2 hours) north of Vancouver International Airport. Transportation options from the airport to Whistler include scheduled bus services, rental cars, limousines, luxury vans. Summer room rates start at CAD $160, winter rates from CAD $410. 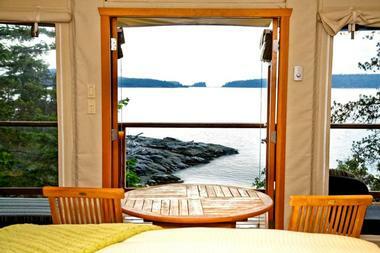 Nimmo Bay Resort is a first class fishing and adventure getaway. Heli-Fishing guests are flown by helicopter to nearby rivers. Choose from 30,000 square miles of land with elevation ranging from sea level to seven thousand feet. The all-inclusive getaway provides all the necessary equipment and transportation. Heli-Ventures include ocean-kayaking, river-rafting, whale-watching and heli-hiking. Kids are welcome to enjoy the unique nature experience. If your muscles are sore at the end of the day, there are massage services, including Shiatsu, Ayurvedic, Reflexology and Reiki. You can also relax in the waterfall hot tubs. The property has received several awards for its environmental preservation efforts. The property recycles all of their garbage and uses environmentally-sound cleaning products. Fishing is 100% catch and release. There are six ocean front and three river front chalets which can accommodate up to 18 guests. Each chalet has two bedrooms, a bathroom and a living room with beautiful nature views. For breakfast, enjoy fresh home made bread and pastries. Dinners are prepared by the house chef and incorporate fresh local seafood. House wine is provided by three local wine companies. The property is open from May to October. Salmon and Trout Fishing adventures take place from July 20 to October 20. Cuthroat Trout and Char Heli-Fishing take place in April and May. Guests can fly to Vancouver, Canada. From there, Pacific Coastal Airline flies to Port Hardy. Guests are then flown by the resort helicopter - flight time from Port Hardy is about 25 minutes. Visit their web site for other transportation options. Packages start at CAD $4,995 plus tax per person for four days and four nights (800-837-HELI). Plan a ski vacation to Whistler and stay at the contemporary Adara Hotel. 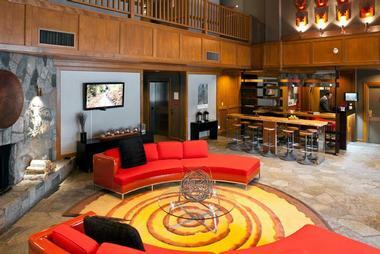 The hotel has a stylish lobby with a fireplace and a lounge, and a year-round hot tub with mountain views. Whistler Blackcomb offers excellent alpine skiing during the winter months. Combine a ski vacation with dining, shopping and other activities in Whistler Village which is home to many coffee bars, clubs, lounges and spas. Suites start at CAD 200 per night. The hotel is offering the "Stay & Ski" vacation package with rates starting at $265 per person (866-502-3272). Located in downtown Vancouver, Canada, the Sutton Place Hotel is a luxury city spa getaway with stylish guest rooms and Vida Health Spa. The hotel interiors are decorated with classical furnishings, crystal chandeliers and marble floors. Vida spa offers a spectrum of traditional and innovative spa treatments, including signature Ayurvedic therapies based on 5,000-year-old Indian holistic health principles. Adjacent to the spa is a fitness center with an indoor pool and whirlpool. Visit the chic boutiques on Robson Street and tour the nearby arts and entertainment districts on your city spa getaway. The hotel has 397 rooms and suites located in a 21-story tower. For best views, book a room on the Deluxe Floor. The Presidential Suite on the 21st floor has a marble entrance, wet bar and two fireplaces. Fleuri Restaurant is an award-winning restaurant with a comfortable yet elegant ambiance. The spacious surroundings provide a relaxed atmosphere to enjoy fine, local cuisine. The food at The Fleuri branches out to various international cuisines reflecting the true global personality of Vancouver. For a more casual meal, visit the Gerard Lounge, La Boulangerie Bakery & Cafe, or order room service 24 hours per day. If you are planning a longer stay in Vancouver, Canada, the adjoining La Grande Residence offers luxury apartments in a 18-story complex. Room rates start at CAD $277 (604-682-5511, 866-3-SUTTON). The Fairmont Waterfront is located on the shores of Burrard Inlet in Vancouver. Plan a scenic city vacation and enjoy the hotel's plush services and amenities. Because of its proximity to the cruise ship terminal, the hotel is a great place to stay if you are booked on a cruise departing from Vancouver. The hotel features spectacular views of the harbor, North Shore mountains and Stanley Park. When reserving your room, ask for one of the accommodations overlooking the harbor. If you want additional service and privacy on your vacation, the hotel offers rooms on the Fairmont Gold floor. The health club has a 50 foot outdoor pool which remains open year-round, an indoor whirlpool, steam rooms, free weights and cardiovascular machines. Plan a scenic wedding in Vancouver with spectacular views of the harbor, Stanley Park and North Shore Mountain. The hotel has a team of expert event planners that can help you organize your dream celebration in Vancouver. Choose from several romantic locations - you can have an intimate gathering the Terrace Herb Garden patio, or hold a gala Vancouver celebration in our the Waterfront Ballroom. The hotel offers one of the best culinary and banquet teams in the city which means that you'll have access to many first class services when planning your dream day. If you decide to get married at the hotel, you well get access to the Platinum Honeymoon Program. You will receive: Private access to a Platinum Concierge to assist with planning the ideal Fairmont honeymoon. Personalized reservation assistance for restaurants, special activities and spa treatments at your destination. Access to the customized Registry website. A gift card to be redeemed for your honeymoon. Bed & Breakfast Package starts from $219 CAD from January through April; from $299 CAD from May to October; from $209 CAD in November and December (604-691-1991). The Fairmont Hotel Vancouver is Vancouver's landmark hotel offering attentive service, luxury rooms and elegant dining. Whether you are in the city on business or on your way to an adventure in British Columbia, you can count on a relaxing stay at this luxury hotel. The hotel has 556 rooms and suites located in a romantic building that will remind you of an English castle. For additional privacy and service on your spa vacation, book one of the Fairmont Gold Rooms which will give you access to a lounge equipped with a computer with internet access, afternoon pastries and an honor bar in the evenings. 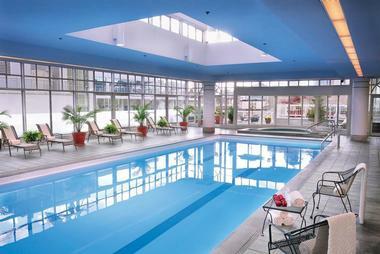 The health club has a 50 foot lap pool, a whirlpool, children's wading pool and two saunas. The fitness center is equipped with free weights and cardiovascular machines. The hotel spa offers a number of unique treatments. Chocoholics must try the Hot Chocolate & Whipped Cream treatment which includes a full body chocolate scrub, a dark chocolate body wrap and a chocolate whipped cream relaxing massage. There are several restaurants at the hotel: 900 West, a traditional steakhouse; Griffins, a Pacific Northwest brasserie; and 900 West Lounge which features live jazz music. Bed & Breakfast Package rates start at $219 CAD per night from January to April and November and December; from $329 CAD per night from May through October (604-662-1929). The answer will depend on your top interests. Are you looking for beaches, mountains, islands or museums, theater, festivals and restaurants? Do you want to relax in a plush room with a view while enjoying farm-fresh food or is your idea of a holiday staying active and trying new activities. In BC, you can have most of these experiences within a very short drive of each other, especially if you plan ahead. There is an endless choice of activities, including camping, fly fishing, backcountry trekking, mountain biking, golfing, ranch vacations, rock climbing and caving. Vancouver, Whistler, and Victoria are the most well known tourist destinations in BC, offering the widest selection of tours, packages and accommodation options, ranging from budget to luxury. Some of the guided tours to choose from include off-roading and ATVing, skydiving, gliding, horseback riding, ziplining and bungee jumping. In the winter, the snow capped peaks let travelers enjoy awesome skiing, snowboarding and backcountry skiing. Whistler Blackcomb is a top-rated ski resort for skiers of all ages and skill levels, from beginner to expert. Head to the the Kootenay Rockies region for cat-skiing and heli-skiing where the sport was born. Cross country skiers have a choice of 50 designated nordic ski areas. Dogsledding and snowshoeing have been gaining momentum as winter sports in the past few years. How do I Get to British Columbia? Vancouver International Airport is the second largest airport in Canada, with flights to major cities across Canada and the U.S., Asia and Europe. Once you arrive at Vancouver Airport, take the SkyTrain - The Canada Line to downtown Vancouver which takes about 25 minutes and costs about $9. Taxis cost around $30, so if you are traveling with a family they may be a good alternative. If you are looking for cheap airfare deals, flying to Seattle may be a cheaper option. Vancouver is about a 3-hour drive from Seattle, while the train takes approximately 4 hours. Visit Vancouver if you want to experience the buzz of the city as well as the beautiful nature just minutes away. Downtown Vancouver has a great selection of shops, cafes and restaurants where you can dine on fresh local foods and relax with a cappuccino. 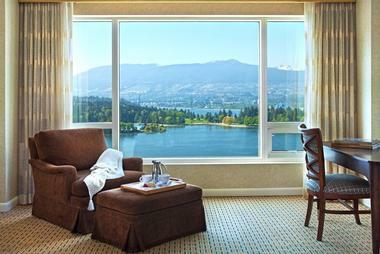 Stay at the Fairmont Vancouver, located in the heart of Vancouver, or book a room in the town of North Vancouver. Vancouver is the third largest city in Canada and is often ranked as one of the best cities to live in. The weather can be unpredictable - July through October is generally the best time to visit if you are looking for sunny days and less rain. In July and August, don’t miss the Theatre Under The Stars which has been a tradition since the 40’s. Bard on the Beach Shakespeare Festival is another great option. Vancouver's annual Vancouver Pride Parade on July 31 attracts over half a million spectators. Upscale hotel rooms start at $200 per night, while mid-range hotel accommodations start at $80. Hostels are the cheapest, starting at about $35. Look for room special in the off season – you can usually find discounts, family packages, honeymoon specials and other offers at luxury as well as budget hotels. The mountains of North Vancouver are just 15 minutes away, letting you go on a quick hike, walk along the Capilano Suspension Bridge and ride North America’s largest aerial tramway at Grouse Mountain. Victoria is the capital of British Columbia, located near the southern tip of Vancouver Island. Although this is an island destination, you can reach it by car by taking one of the car ferries. Victoria International Airport, 30 minutes north of Victoria, offers many flights from Vancouver and Seattle, as well as direct flights from San Francisco, Calgary, Edmonton and Toronto. You can also take a float plane or a helicopter from Vancouver with prices starting at about $100 each way. Although a bit more expensive, arriving by float plane will let you enjoy amazing views of the city and the surrounding area. The best way to get around once you are there is by bike – there are many places to rent bikes and the city is one of the most bike-friendly in the world. Miniature World next to the Fairmont Empress hotel will make your kids feel like giants, surrounded by 85 miniature dioramas and displays, including great Castles of Europe, the Changing of the Guard at Buckingham Palace and the Great Canadian Railway. You can spend a whole day at the Royal British Columbia Museum which offers diverse exhibits highlighting BC’s history and culture. Take a tour of the Victoria Harbour which let you get a unique perspective of the Selkirk Waterway and Inner Harbour. There are several whale watching companies which will take you close to resident Orcas, as well as Humpback and Gray whales during their annual migration. Visit the wineries on Saanich Peninsula, a 45 minute drive from the city. Return to this amazing destination year after year to discover new places, events, festivals, beer, wine and food. Here are some other top spots to consider for your trip. Whistler: Visit in the winter to ski and snowboard on two mountains which offer over 200 runs, the largest ski area in North America. Vancouver Island: After exploring Victoria, visit other destinations on the island, including Pacific Rim National Park in Tofino, the quiet waterfront community of Sidney and the scenic Port Renfrew. Prince Rupert: Located on the orthwest coast of British Columbia, Prince Rupert is the rainiest city in Canada. There is fantastic deep sea fishing here, with several fishing charters offering one-day and longer excursions. Fraser Valley Wine Tasting: There are several great wineries in the area, including Lulu Island Winery in Richmond, Lehman Winery in Abbotsford and Domaine de Chaberton in Langley.